On the 26th of March 1964 families were scurrying to the Suva wharf. Moored at the wharf for the final time was the Kadavulevu. The day planned 2 years earlier was finally here and the excitement was palpable. 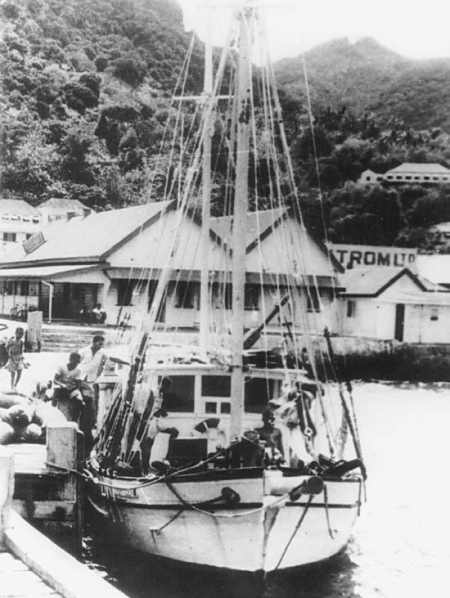 The 44 year old schooner was destined for Waitoga village in Nairai. The women from the village had requested Temalesi a Nairai woman living in Suva for funds to help repair the village church. The auxiliary cutter Kadavulevu was chartered for the trip. Built in 1920, she was 23 GT, 58 feet in length, and 15 feet in breadth and had recently been surveyed and licensed for the carriage of twenty-two passengers and seven crew . The vessel carried lifeboats and life rafts to take thirty-one persons, and lifejackets for twenty-nine. The Fijian captain was an experienced seamen, Filimoni Samaki, aged sixty-two. He was qualified for this size of ship and had thirty-five years of sea service locally. On the afternoon of 26 March members of the party began to board the ship. They stowed their kaukau (goods to present) in the hold and elsewhere. These included single and double beds, bales of cloth, 173 mats, and on-deck pens of fowls and drums of kerosene. They also carried food and drink for the trip and AU$800 collected for the church. People continued to arrive at the berth by taxis up until after 2200. By the time the boat left Suva at 2240 there were some ninety persons on board. Fortunately the weather was favorable for the sixty-five-mile passage. The boat anchored off Waitoga village before midday on Good Friday, 27 March. Everyone disembarked by boats, and the goods were unloaded. After being housed and fed, the visitors presented their solevu and money at the rara (ceremonial grounds). There were speeches, and quantities of yaqona were consumed, followed by a magiti (feast) and meke (women’s sitting dances) and later a taralala (joint circle dance, one behind the other). On Saturday the Waitoga people arranged their solevu in an elaborate display some five feet high. This comprised 250 Nairai thick mats, 3 tons of yams, 4 tons of dalo, 800 coconuts, 3 sacks of tapioca, 8 bundles of bananas, 6 bundles of voi voi, 150 bottles of coconut oil, 8 live pigs, and 4 live chickens. A magiti, dancing, and drinking went on until midnight and, for some men, throughout the night. On Easter Sunday all but three of the original passengers boarded along with four additional from Nairai. All the goods were stowed along with personal gifts. The ship sailed at 1530 for Suva. At 1900 they passed the island of Gau. The sea was then rough, and the boat was rolling heavily. After some debate it was decided to press on to Suva rather than shelter at Gau. At about 2300 the Kadavulevu capsized within sight of the lights of Viti Levu. There were only three survivors. They were able to relate what happened. One woman (Nina, aged forty-nine), who was supported mats at night saw a raft. She climbed on board, as did about ten other people, including two sailors and a boy aged fourteen. On Monday morning there was only debris to be seen in the rough sea. The sailors managed to retrieve green coconuts and peel them with their teeth for the survivors. By Thursday only one woman and the boy remained there to be rescued. All others on the raft had disappeared into the sea. The sailors may have tried to swim ashore for help but never made it. The other woman survivor (Saine, aged forty-three) also left the raft to swim ashore. She supported herself with timber and was washed up on a reef on Thursday morning. From there she swam ashore and gave details of the tragedy to the marine rescue parties already searching. By then about ninety people had drowned. Changes were made to maritime laws as result of the Kadavulevu disaster. I was there, before the boat left suva. The Captain of the boat we knew was Samson Lee a close friend of my dad. I went and hide myself in the boat because I wanted to go for the long weekend, but the captain said ,its too many people, and he will take you another day. He lifted me out of the deck and put me back on the wharf. the last time we saw him. He took us once to nukulau on the boat for a family picnic. He aslo gave a sawing machine as a gift to my mum. My Dad told me that his friend, left the huge amount of money with him for 3 weeks , when he came to purchase the boat. He trusted my Dad. My Dad’s workshop was located at the backdrop, which was the United Taxi garage. The bridge is now there ,across to Village 6 . Thank you for the insight on that fateful day. I wish Fiji had movie makers who could make this into a movie. That lady that survive the sinking Kadavulevu was my grandmother (Nina Rareba)… my mother’s mum. So exited to see this post and hear more reply on the actual event. Vinaka. My mothers elder sister (Anaseini Namakadre ) who was a nurse was on board too. She always had a good heart which is what took her to Nairai for the charitable deed. She drowned but left behind 2 wonderful daughters, my cousins, one is now Mr’s Unaisi Tuinabua wife of Mr Samuela Tuinabua, Principal of Lautoka Teachers College. The other cousin is the former FBC radio announcer Mr’s Maca Malugu. Maca now lives in the United States. Isa, I was 17 years old when I read about this disaster. It was such sad news. Isa, I was 17 years old and I remember reading about this sad story. I was a thirteen year old boy living in Tai Lomaiviti in Raiwai, where most of the people who went on the trip lived. My cousin Viliame was also on the boat but was found and taken ashore. My other cousin Atunaisa went and was lost with the rest. No household was spared. There were strong winds and heavy rain and the whole of the Rewa delta was flooded.When people say that the people lost during Cyclone Winston was the worst ever for Fiji, I point to the Kadavulevu disaster as worse.There is also record of an even greater loss of lives in 1886 where I believe 96 people lost their lives, also at sea. The real tragedy is that the Kadavulevu disaster was preventable. As mentioned above by Mr.Apaitia Seru, Our grandmother or our mums mother Nina Likulawedua Rareba was a survivor of that ill fate trip on the Kadavulevu. Her namesake has carried that legacy through her name as a Fiji national netball representative known as Nina likulawedua Cirikisuva.I was born on the same year but nine months after the disaster took place. Isa I accidentally came across this site while trawling for Fijian songs, and want to thank the Administrators of the site for their fine effort to put the site up. I clearly remember this event as a small boy as it directly affected my family. Though my mind is getting hazy on some details, I seem to recall a lady by the name of Wakesa (?) as one of the survivors. It may just be that her name was Saine Wakesa, but I clearly remember her interview on FBC. In any case, my aunt Venina Wati had decided to go on this trip with her husband Mosese, who I believe was from Gau. My aunt’s younger sister, Emele Ravaga, who was about 14 then, caused an ongoing ruckus in their home until they relented and agreed to take her, much to the anger and chagrin of another uncle, who had serious foreboding of this pending misadventure. While the three relatives tragically perished at sea, I remember my mother taking many years to come to terms with this tragic loss. In her quiet melancholic reflections she used to say she hoped the three were still alive having washed up in a remote and deserted island. Those forlorn hopes most likely shared by so many families mark an apocalyptic moment in the annals of Fiji’s maritime history. This many years later, the faces of my lost relatives are still so clearly etched in my memory. May they rest in eternal peace. My mother Nina Rareba was the one that survived in the Kadavulevu with the young boy Viliame Qelo. My mother boarded the boat with my two sisters, but they didn’t make it back. I still reminisce about them. Thank you for publishing the story behind the song about the Kadavulevu Disaster. I was delighted to read that one of the survivors is still alive and well. I have not added this as a comment as I am concerned about privacy considerations but thought you may be interested on a personal basis. George Dregaso comments on your web site that the 14-year-old survivor is Joeli Kalougata but Patiliai Lrqa names him as his cousin Viliame. I believe the latter to be correct. The name Joeli Kalougata did not come up during my enquiries but as we found at the time, Fijian naming conventions are complex with some passengers known by several different names depending upon who was offering it. I was Staff Officer at Police Headquarters, Suva, and was responsible for the police involvement in the search and rescue operations as well as the subsequent victim identification investigation. I interviewed Viliame Qelo Vueti, the son of Isikeli Qelo Vueti and Vinau Camari Vueti, at Central Police Station, Suva, shortly after his release from hospital and took a statement from him. It is fascinating that the dreadful tragedy is remembered in song after all these years. Should you by any chance be in contact with Viliame please extend to him my very best wishes. I remember my tour of duty in Fiji with great affection and was invariably treated with kindness and respect by my Fijian colleagues. One of our daughter’s was born there. Yes I remember the events as it shook all our families in our islands. I was a class four student back then. We, however, continue to disregard the final words of the lyrics of Kadavulevu: ME SA KUA SOTI NA VODO VAKAVITI!! One only needs to be at Narain Jetty during holidays and particularly the Christmas holidays to witness that “VODO VAKAVITI” is still alive and well in our society!! Oilei o keitou li mai Kadavu!!! UUUUUUUUUUU!!!!!!! My name is Elspeth Kong, married to Ben Kong who is the youngest brother of Samson Lee and his brother Peter Lee. When I heard the Kadavulevu story from my husband 46 years ago, I have been wanting the Lee family to make a memorial to those that lost their lives. Too many years have gone by and these people should be remembered in a tangible way. What do the families and Fijian people think about this? We and our children would like to see some suitable acknowledgment to respect the families of those who died. Most grateful for the Kadavulevu posting and the comments of readers. Relatives were lost as well as a class mate from Suva Methodist Boys School. I began looking for the Kadavulevu story to verify whether the sinking of the Syria was the worst maritime disaster in Fiji.59 Indian indentured labourers and crew perished as the ship broke up and sank on Nasilai reef. It is apparent that Kadavulevu was the worst disaster with more than 80 deaths (84?). We really need to ensure that ‘vodo vakaviti’ is brought to an end, and that life jackets and life rafts are available for all passengers in our ships.